The Overlander boomspray from Jetstream incorporates a 24 metre (27 metre optional) hydraulic lift and fold boom design (no cables or pulleys) with a 3000 litre or 4000 litre chemical tank, at a lower price than competitors. The Jetstream Overlander is an ideal broadacre boomspray for the large size farm. This model is renowned for being one of the most advanced and rugged hydraulic fold spray rigs on the market. The Overlander provides the user with the 100% accurate ground drive system for renowned simplicity (Just fill and spray! ), or the Farmscan 24V1 computer controller with no additional cost. The ground system uses a colour coded pressure gauge that is easily seen from within the cab to give variable speeds and 100% accuracy (no need to spray at a set speed). The Farmscan 24V1 computer monitor provides the ultimate in spraying flexibility with the easiest to use monitor on the market. Standard equipment includes electric in-cab 2-section boom on ground drive with 3-section on Farmscan units and dual sided foam marker controls. The electric valve configuration allows manual operation where electrical supply failure may occur on both ground drive and computer controlled models. Exclusive Jetstream 120° stainless steel nozzles are standard on the Overlander models for unmatched coverage. Single axle with 38 X 14.9 wheel configuration is standard on all units giving excellent ride and stability. The rugged chassis enables the Overlander to be configured with an Electric Tandem Sprayline (optional), giving it a top spraying speed of 34km/hr (42km/hr for computer controlled). Booms are constructed of high quality steel and use a unique double acting spring loaded main boom hinge system to eliminate boom whipping stress. In addition to this there is an end of boom breakaway. Boom suspension is provided by independent hydraulic dampening suspension. 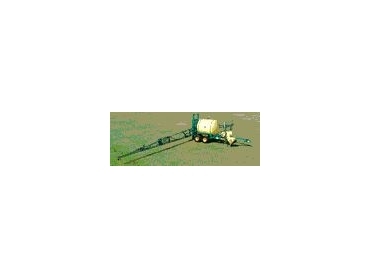 Standard features include electric over hydraulic operation (only requiring one pair of remotes), individual boom tilt function and exclusive boom tip tilt (allows for varied spraying widths and contour banks to be sprayed). Boom stability is excellent with this design and nozzles are protected from impact damage. The Jetstream 3000 litre and 4000 UV stabilized poly tank provides unmatched agitation, stability and flexibility in all terrain. The tank colour is transparent and allows visual monitoring from the cab of chemical solution levels using the moulded calibration markings. Other standard features include granular/liquid chemical induction hopper, 120mesh filtration, 135 litre foam marker tank, 135 litre freshwater tank and in-built boom flush capabilities. Jetstream is well aware that farmers requirements vary greatly. By providing a huge options list on the Overlander, farmers are able to customize each machine to suit individual needs.